Why are SF and Fantasy so often grouped together? Obviously, because they share readership and so are placed together in bookstores. And… heck… some of us write both! Still, there are very real differences. Look, fantasy is the mother genre—e.g. Gilgamesh, the Illad, Odyssey and most religions. Sci Fi is the brash offshoot. All literature has deep roots in fantasy, which in turn emerges from the font of our dreams. Having said that, what is my definition of the separation? I think it is very basic, revolving around the notion of human improvability. It never even occurs to Aragorn or Gandalf to give the poor the godlike powers they themselves get to wield… let alone provide them with libraries, running water, printing presses or the germ theory of disease. Only little Peregrin Took seems to get a glimmer of an idea in that direction. The only character who briefly ponders possibilities, and he’s soon bullied out of it. Fantasy has its attractions. Something about feudalism resonates, deep inside us. We fantacize about being the king or wizard. Heck it’s in our genes. We are all descended from the harems of the guys who succeeded at that goal. The core thing about fantasy tales is that, after the adventure is done and the bad guys are defeated… the social order stays the same. It may be the natural genre… but should we be proud of that? Science fiction, in sharp contrast, considers the possibility of learning and change. Not that children always choose to learn from their parent’s mistakes! When they don’t, when they are obstinately stupid and miss opportunities, you can get a sci fi tragedy… far more horrible than anything “tragic” in Aristotle’s POETICS. Aristotle says tragedy is Oedepus writhing futilely against fate. A sci fi tragedy portrays people suffering, same as in older tragedies… but with this crucial difference— things did not have to be this way. It wasn’t “fate.” We—or the characters—could’ve done better. There was, at some point, a chance to change our own destiny. One type of tragedy makes you weep—hey, Oedepus is powerful stuff. But for millennia the deep moral lesson—the thing taught in all “campbellian myths”—is that resistance is futile. The overall situation, the rule of fate, remains the same. The other type of tragedy—the new kind—is a cautionary tale that may change your decisions. It may alter destiny. You can see why the absurd old farts who inhabit most lit departments hate science fiction. SF considers it possible that the eternal “verities” and relentless stupidities praised by Henry James might someday be obsolete! If we make kids who are better than us (our goal, duh?) then their Startrekkian heirs will still have problems. Why insist that our descendants have to fret over the same ones? Can’t they assume the solutions we find, take them for granted, and move on to new, interesting issues of their own? Isn’t that what we did? The implicit assumption in most fantasy is that the form of governnce that ruled most human societies since the discovery of grain must always govern us. And when a fellow like Tim Powers resists that assumption, he is writing science fiction, whether or not there are pirates, or wizards or demons. ...AND THEY WANT THOSE THINGS BACK! They want starships. And Anne is going to let them earn those things. They will get them back, and move on. And she is a science fiction author. Not buying it, trying to politicize the difference between the genres. While I am a huge fan progressive SF, - eg KS Robinson or Scott MacLeod - that’s a subgenre, not the definition by which all SF or Fantasy is to be judged. There are works that blur the lines, and that’s part of my point. The lines aren’t clear and can’t be made clear. Fiction, nonfiction, and genres are terms of convenience, which operate more like improvised post hoc rules, than library classification systems. I use “science fiction/fantasy” or “current events” as a way to choose which bookshelf I head towards, but I am just as likely to buy something by Michael Moorcock as I am by David Brin, both great writers with progressive sensibilities. It’s an interesting point M. Brin makes here. But is that really the only difference? I personally made a MA thesis over science-fiction theatre in which I dedicated a chapter to this subject, making use of a former work made by Alexandre Drouet. Our point was that what made the biggest difference between fantasy and sci-fi was the justification made of the elements appearing in the story that one wouldn’t expect to meet in everyday life realm. For fantasy, teleportation for instance would be explained by a magical argument: “Using the spell written in the scroll the druid had kept hidden, one can move instantly from one place to another” - that’s about it. What is important wouldn’t be the lenght or the complexity of the explanation, but its scientifical foundation. (Oh, and, taking in consideration what C. Earp just wrote, it’s not because some story couldn’t be classified as science-fiction (using this definition or another) that it couldn’t be a good one. Neither would that be a good reason not to read it. But I’d like to know what I’m about to read before I start reading when I find some book I haven’t yet heard about). I sense what Mr Brin wishes to say, and he’s not alone in frustration at the rigidity the genre can have, but I feel the logic doesn’t hold. 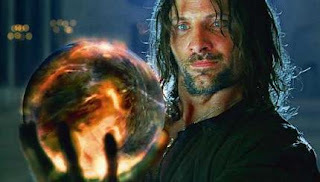 While we may feel that feudalism is inherently wrong, and recognise that an Aragorn may not be able to pass around improvements of the kind we’d perhaps like to see, it’s harder to argue that the rule of an Aragorn would not be a boon at that stage, bringing a mood more tolerant, more conducive to research and development, and the use of knowledge for gradual improvement. His ancestors in particular likely had to improvise, and he is cast as bold and inventive. Look at other assumptions here. But fantasy is not only feudalism, or in a given work necessarily any feudalism. This may simply be lazy thinking on the part of the writers in question. There is lazy sci-fi too. The genre is what the writers make it, unless Mr Brin’s definition of fantasy is his own, in which case I do feel he should be more precise. Nothing conceptual stops any of us from writing fantasy with change we ourselves would regard as positive. Re the comment by Charley Earp too, there is a tendency - which I sense Mr Earp does not fully subscribe to - to believe that change is inherently positive. I do think the jury will be out on that one for some time to come, although my personal understanding tells me change is likely positive on balance. The term ‘progressive’ does seem to be used as a loaded term at times, a suggestion the writer is perhaps more humane on the one hand, or less realistic on the other. Who judges that Starship Troopers is ‘regressive’? As a work of imagination and the construction of a world, it is essentially positive, a thing to examine and discuss, a tool in the argument. The supposed views of the writer may not be an approach I consider fully right, perhaps largely because I grew up in this place at this time, but I can see the merits, and I can learn from it. But we are here, and we don’t need to believe that. Maybe it always was “a cautionary tale”? Quite simply, “learning and change” are not considered only in sci-fi. I’d agree with Porky here, or at least what I think he’s saying (And not only because he gave me a spot on his blogroll, and turned over Flash Fearsday to me). You argue “It never even occurs to Aragorn or Gandalf to give the poor the godlike powers they themselves get to wield… let alone provide them with libraries, running water, printing presses or the germ theory of disease. Only little Peregrin Took seems to get a glimmer of an idea in that direction. The only character who briefly ponders possibilities, and he’s soon bullied out of it.”. Peregrin Took set up a library in the Shire, open to anyone who could get there. There were also such libraries in Rohan and Gondor. Running water, if they had it in Gondor, was probably via aquaduct - not exactly practical to run over the hundreds of miles that might be necessary for places like, say, Hobbitton, which is in the middle of a large plain with no water at a higher altitude nearby. Everything was handwritten, including important histories. Were they supposed to invent the printing press and then distribute it? The same goes for the germ theory of disease. Also, as I said above, Peregrin Took did what he could of this, so your assertion that he was “bullied out of it” is also wrong. As far as Anne McCafferry, for what are probably her most famous books in that series (Dragonflight, Dragonquest, and The White Dragon) I wouldn’t tell someone who’s interested in picking them up that they’re sci-fi - because, really, they aren’t, until the very end of The White Dragon, and a bit in Dragonquest. (Not to say that she doesn’t also write good sci-fi. For example, the earlier (in story terms, anyway.) books in the same series, or the Pegasus books.). The characters in those don’t, in fact, remember when they had “...flush toilets and universities and democracy…”, other than in the sense that the Crafthalls do practice at least limited democracy, and the Harpers act as tutors, with especially good students being sent to a Harper Hall. (And no, I don’t feel silly about arguing that point; made that comment, not the author). If you were to tell someone that, for example, Dragonflight is sci-fi, they’d think you were cray after reading it. Those are, really, more fantasy in a sci-fi background, than sci-fi, and the background isn’t apparent until the second book. Developing a Fantasy setting that goes outside the bounds of the expectations of the audience established by Tolkein, etc. is risky business. Moorcock did it, Mieville does it, there are others. But if you start exploring alternatives to feudalism, for example, you either get labeled Alternate History, or steampunk, and/or you loose the built-in audience. Science fiction is likewise just as ideologically cramped with out-moded and exploded theories to the point that most of it is effectively a rational mirror of the irrational landscapes of fantasy. They are like two sides of a much larger, more inclusive coin. Both tend to accept limitations that are more a matter of convention and conformity than anything ‘real’ or ‘actual.’ But going out past the perimeter of what is Established…well…good luck with that. We’d love to see more excellent stories that didn’t necessarily fit into convenient marketing categories, but then that’s a challenge to the feudal mindset of publishing, isn’t it? I think that I might draw the lines of demarcation a little differently. For starters, I don’t believe that Fantasy teaches us to be resigned to Fate. Fate and Prophecy appear frequently in Fantasy stories, but often more in the role of a challenge to be met by the heroes than of a foregone conclusion. In LoTR, Gandalf says “Surely you don’t disbelieve the prophecies just because you had a hand in bringing them about!”, yet the reader in LoTR, and in most fantasy, has the definite sense that the outcome could have been far different, if any of the characters had chosen differently, had not shown courage and determination, had not persevered through daunting and seemingly hopeless situations, and had not acted from positions of high moral and ethical standards. On one level then, prophecy or fate in the fantasy story is the yardstick against which we can measure our hero - did he or she fulfill the prophecy? Was he or she found worthy in spirit and deed? If so, then his or her behavior is a worthy guide to how we should conduct ourselves when faced with similar, if less potentially Earth-shattering, situations. If not, then his or her behavior is still a worthy guide, but a guide of how not to behave. Far from teaching resignation to injustice and social inequity, many fantasy stories are explicitly about the weak or the disregarded finding the courage, the skill, and the ingenuity to defeat the established power structure when it has become corrupted or destructive, and establishing or re-establishing a more just and equitable system with the formerly-powerless taking control. Fantasy uses archetypal settings and elements, many of which derive in part from feudal systems and mythos - kings and peasants, damsels and monsters, swords and shields, magic and witches, and dungeons and riddles - not because feudalism mixed with superstition is or was such a great form of government and social structure, or even because readers want them to, but because fantasy deals with archetypal themes where the details of the setting are not the important issues, where, instead, the questions are of the relationship of the powerful to the weak, of what constitutes the nature of good and the nature of evil, of the right relationship of the individual to the society, and of the society to the individual, questions and answers that are intended to be universal, or at least culture-wide, and that are primarily directed at issues of human relationship and moral behavior. For these types of stories, being able to access the rich history of previous experiences and literary references that most readers already have around these types of characters allows much more freedom to spend time and text on the interesting and meaty part of the story rather than spending a great deal of time developing the reader’s understanding of what a “king” or a “wizard” is. There is plenty of this type of archetypal fantasy that gets shelved under SF, in my opinion, and these science fantasies are littered with similarly readily-recognizable archetypes, just decidedly non-feudal ones: “The Mad Scientist”, “The Flawed Creation”, and “The Unsuspecting (member of the ) Public”, as well as “The Scientist-Messiah”, “The Greedy Competitor”, “The Miraculous Creation”, and “The Unappreciative (or Idiotic or Interfering) Public”. From my perspective, then, the core difference between the two genres is that fantasy is almost always about the big picture of what should be, and SF is much more about the details of what could be and what is. I would point out the Valdemar series as being a bit more “progressive” than most fantasy. A bigger difference I usually find is that fantasy tends to be easier to write because you can “hand wave” nearly any sort of science as “magic” without needing a rational explanation for why it works. Take the LOTR world for example. The history of third earth is well established through the series, and yet someone from the era of the trilogy could have lived in the era of the Silmarillion, AND NOT HAVE NOTICED A SINGLE DIFFERENCE. The universe was stagnant, nothing having changed for more than three thousand or more years. Why? Because this is a world in which “gods” can dictate that society stands still even though time appears to pass. It’s simply unquestioned because this is a “fantasy”. Had Frodo been carrying “the one true data storage disk of Sauron” we would have needed endless explanations of why scientific progress had come to a screeching halt. I tried to write a sci-fi story set a million years in the future. The problem I continually ran into is that even with extremely slow technological development projections, i.e. using the absolute most pessimistic futurist projections of technology and extending them by several factors, I still could not escape the realization that taken to the logical extremes, technological society would always develop into something that most readers would find to be far more akin to a technomagical fantasy setting than “hard sci-fi” in much less than 100,000 years, let alone a million. This is the primary problem with writing “Hard” Sci-fi in the present day. Anyone who has done their research into developing science knows that any serious foray into the distant future is nearly impossible to portray unless they severely restrict technological development. Other than this color commentary, I think Jennie explains my core views far better than I would, and while I think Mr. Brin has some interesting insights, nearly all sci-fi and fantasy is at it’s heart the story of a small group of people who through courage, determination, and perseverance overcome the forces of the destructive impulses of human nature to promote it’s better side. Even when it uses the motifs of “fate” or “prophecy” it is always the “light” that wins, the “dark” defeated. If the prophecy claims victory for the dark, it is always false, if it is for the light, it is always only able to be fulfilled after massive effort. “Evil” is the easy path, “Virtue” is the hard one. This article reminds me a little of Michael Moorcock’s piece ‘Epic Pooh’. Both suggest that fantasy as a genre and Lord of the Rings in particular are reactionary and glorify past social orders. That may or may not be true, and I’m not convinced that sci-fi is devoid of this, as others above have noted. One comment that I would like to make is on the nature of fate and tragedy in story. I think Mr. Brin may have misunderstood Greek tragedy. The lesson is moral, not technological or political. The sort of modern stories he alludes to, where a poorly implemented technological advance results in some morally abhorrent situation that could have been avoided, are not tragic. The very fact that it was within the character’s power to have averted the bad consequence simply shows that the characters failed morally. They had the power and they used it unethically. Moral weakness or lack of foresight in a character are not tragic, they are despicable. These stories, far from being “more tragic” than the Greek plays, are simply stories about stupid unwitting villains. In a truly tragic story, there is no way for the characters to avert the bad consequences. “Fate” is not short-hand for “lack of moral courage or technological knowledge”, it is short-hand for “circumstances from which we cannot, no matter what we choose, emerge unscathed.” Oedipus is a good and wise man. A hero. Every choice he makes is a choice that we would think of as being the wise and morally good one. And he still ends up wandering blind after destroying all the people he sought to protect. Life sometimes has truly tragic situations, as the Greeks recognized, and if science fiction denies their existence on the basis that they belong to a previous era then perhaps we should call it fantasy!